The best way to get pet urine out of concrete is to first, use a black light to find ALL dog or cat pee stains you must remove. Next, clean with a 2:1 vinegar/water mixture and rinse off concrete. Then, apply and scrub in liquid enzymatic cleaner. Molecular biological catalysts dissolve and remove odor caused by urea and uric acid. Cover and let cement soak 12-24 hours before wet-vacuuming. Dry and deodorize residual room urine smells with an ozone generator. So you have a concrete floor, perhaps in your basement, garage, patio or under your carpet in your home that seems to be permanently stained with pet urine, a.k.a dog or cat pee. You can smell or see pet urine stains that no matter how much you bleach or wash with vinegar don’t go away. It’s as if you have to settle with the fact that once dog or cat urine has seeped into concrete, it’s there forever. What’s worse is it seems to give off a permanent urine odor, constantly releasing odorous and offensive fumes. Let’s take a look at how we can remove pet urine from concrete the right way so that you have a clean smelling cement floor again. 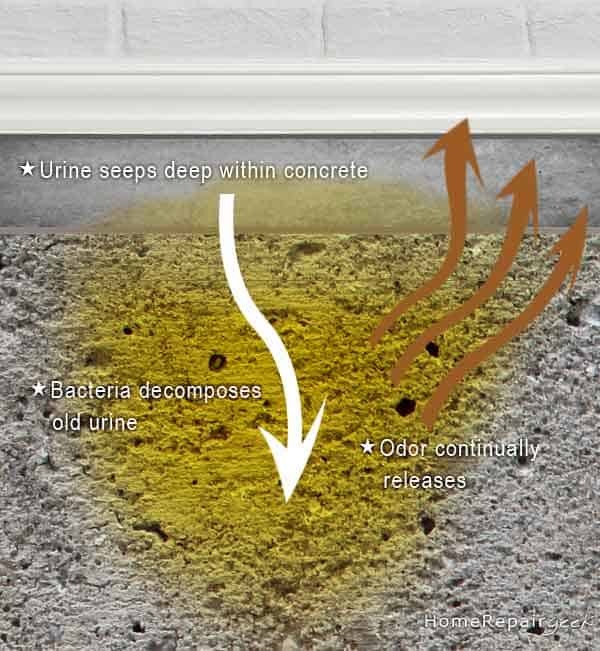 Before we get to the real magic, here are some basic facts about concrete, liquid and well…pee. This knowledge will help you understand why the remedy we cover below works so incredibly well to get cat pee out of concrete, especially. As you already know, concrete is dry and hard as rock. But it is also quite porous. This means, that anything liquid that comes into contact with bare (unsealed) concrete will saturate concrete completely. Usually this is harmless, but not when it comes to pet urine. Dog or cat urine can seep deep within concrete; and anyone who has had cats or dogs knows that animal urine can be difficult to get rid of from your garage floor, basements and under carpet pads. What’s worse is this potent stuff can lie dormant inside the concrete, only to release its odor when moisture gets back down into the concrete. The fumes will find their way into anyone’s nose who is nearby. Yuck! You’ve probably discovered you can’t just “clean” off pet urine with whatever concrete cleaner you’ve chosen. You must get it using a series of steps, each one playing a role in ridding the urine smell from concrete once and for all. When you’re looking at how to get cat pee out of concrete, especially, it’s not a project to take lightly in most cases! You’ll be happy to know that cleaning the surface of urine stained concrete is the first one, so if you’ve done this, it wasn’t a waste! First, thoroughly clean all concrete surfaces with a vinegar/water mix. Since the vinegar is so strong, you can get by with a 2-to-1 ratio mix with water. To really help you identify and pinpoint the entire affected area you can use a black-light. It’s made just for pet urine detection and reveals any of the urine spots on your concrete. In addition, the best method is to plan to treat the entire surface of the concrete in question so you don’t miss any hidden spots. Covering everything will obviously ensure the treatment will be consistent across your floor and leave nothing behind. 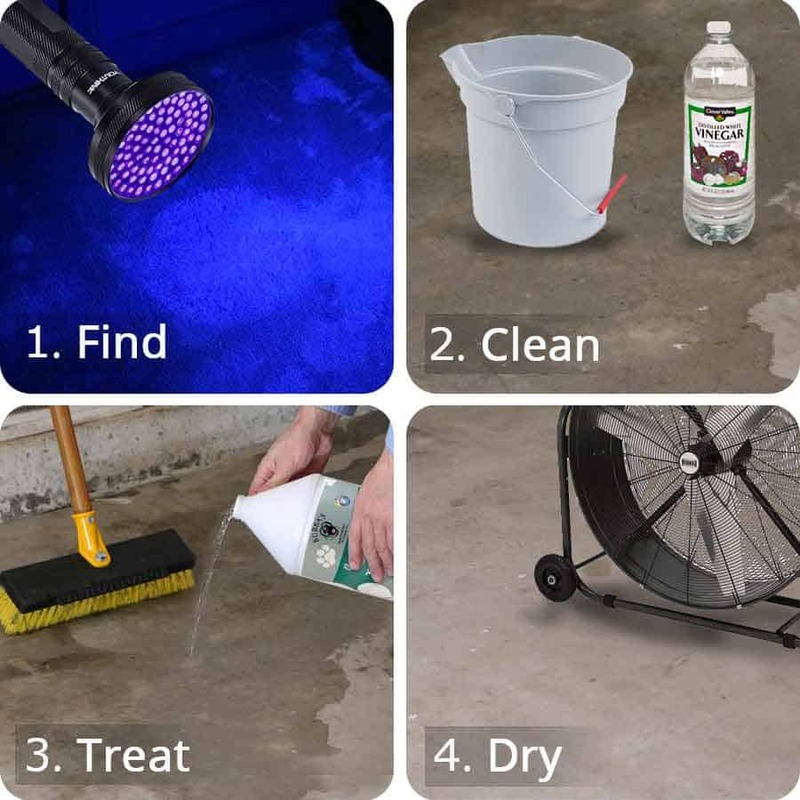 Second, use a special cleaning solution to permanently dissolve and remove stains and odors from the top, and just below the surface, of your concrete. This is an enzymatic cleaner that vets recommend because it’s safe to use in your home around your family and pets: Get it here for both cats AND dogs. They also stand by their guarantee that if the smell isn’t removed, you can get a full refund. You can’t beat that! It works great on concrete for dogs, and especially cats that have peed or sprayed (accidents or from marking territory) on hard, porous surfaces. It can also be applied to furniture upholstery, curtains, blankets, mattresses, clothing, carpet and carpet pads. The best way to use this for getting rid of pet urine on concrete is to spray it on thick all across the cement surface. You can also pour it out and spread it around evenly using a deck scrub brush like this one. The idea is to get the top surface soaking with this enzyme cleaning solution. You want it to really work its way down into the concrete and not evaporate too quickly into the air as it dries. The more time the stain eating enzymes have to digest the odor causing molecules, the more effective this process will be. To control the evaporation, lay a large plastic tarp or liner over the sprayed area. This will allow the solution to better penetrate into the urine stained concrete. Allow to dry for as long as it takes, or at least 24 hours. You can rinse the surface and use a wet-vac to vacuum up but this isn’t necessary because the nitrogenous wastes causing the stench have been chemically altered and no longer smell. 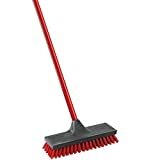 By the way, this type of cleaner comes in smaller (cheaper) sizes too for cats and dogs. should you not need to treat large areas or multiple rooms. These work on multiple surfaces including concrete. And of course there are many other great products that work well for cat urine stains too. When you’ve cleaned and sanitized the top portions of your concrete as outlined above, and everything is dry, you have the option to seal your floor. This will encapsulate and essentially seal your concrete against moisture that can get inside and release what may be left of any missed urine stains. Sealing will also be a great general protection for your floor for future accidents, as well as look a whole lot nicer. Be sure to use concrete sealer with an anti-slip rating. A low-sheen is best as it allows for easy cleaning. Kilz makes a concrete sealer that is ideal for this kind of application. The best part is you can choose a new color for your garage or basement floor to get your floor looking just how you want, then seal it. Okay, maybe the best part is your floor will actually smell the way you want (not like urine), as you’ve now cleaned and sealed your concrete floor. You’ve gotten rid of pet urine stains and smells from your concrete in the best way possible. At this point, you’ve cleaned and dissolved away as much of the odor causing urine crystals and stains as possible. You may have even decided to seal your concrete as an extra measure against any future reactivation of odor and to protect for the future. You may still smell urine depending on the room and make-up of all the other items in your house. As with smoke, pet odors like urine can permeate into places you can’t imagine and leave a prolonged residual, yucky scent. If you want to go the extra mile here and eliminate any possible left over urine odor, it’s worth using an ozone generator. This is a small machine designed to deodorize the air along with any contaminated surfaces. Just like enzymatic surface cleaners, it will neutralize and destroy odors at the molecular level AND do it 100% naturally without harsh chemicals or odor masking scents. If you’re at all sensitive to irritants in the air, you’ll love this thing. 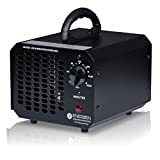 Enerzen sells a good portable model at a decent price. This truly will leave your home smelling pleasant again as it gets rids of any other smelly culprits as well such as mustiness, smoke and dust. If you have a cat that frequently “misses” the litter box you can actually address this behavior. There are methods available to help solve problems such as your cat peeing on carpets. One popular system developed by vet, Sarah Richards, is called “Cat Spraying No More™“. Click here to check out her page, and see how it can help you and your furry loved one. A lot of people have had success with it! *Note: If you click through to her checkout page, then attempt to go to another page you’ll get a special discount offer. Definitely worth it! Dog or Cat Pet in Carpet? If you have pet urine odor or stains in carpet and have tried the typical solutions (like vinegar, ammonia, rubbing alcohol, hydrogen peroxide, etc. ), then you should definitely try the enzymatic approach here too — just like with smelly pee and stains on concrete. And as with concrete, you need something that will get in and penetrate the fabric (in the case of pet stained carpet), and break down the odor-causing elements of the stain. Bubba’s makes a wonderful enzymatic carpet shampoo solution that is perfectly safe for you, your pets and your rugs. Applying this is a very small investment to pay for removing pet odors and urine stains from carpet! First, clean it up. Second, use enzymes to alter the trapped urine with the recommended product above. Next, you can seal it to encapsulate any remaining contaminants. Finally, use the ozone treatment to remove any residual odors in the air coming from any objects in your home. Do all this, and you’ll be set for life…at least when it comes to smelly pet urine stains! Thank you so much for the info. I own 2 old staint bernards and one of them has lost control of her bladder at night. I tryed to clean with bleach thinking that would definately get the smell. Well, I almost poisened my self! I wasn’t aware the mixture makes a poisenoius gas. I’ll give this your suggestions a try. I just read your article; thanks. After cleaning the concrete, I’d like to have the floor tiled. Sealing the concrete as suggested won’t be possible for this reason. Will any lingering odors work their way through the tiles??? If im going to re-tile the floor do i still need to seal concrete. Sealing won’t be necessary in this case. The tile and the grout will block any odor that might remain. But there *shouldn’t* be any odor left, so make sure you follow the instructions carefully and re-apply. Give the mico-organisms in the Urine-off time to devour any remaining urine molecules deep inside the concrete slab! You are correct, for best adhesion of the tile and to prevent moisture trapping issues you’ll want to lay it over a bare slab. Your ceramic or stone tiling will do a great job creating a barrier to any pet urine left below. Anything “left” is dry and cannot seep back up to new materials. If you use the bio-enzymatic product step for step as described, you should not have any lingering smells anyway. Good luck!